The legendary Italian guitarist Mauro Giuliani's private life during his stay in Vienna has always been overshadowed by a small mystery. It is known that he fathered an illegitimate daughter with an obviously Viennese woman, but nothing could ever be revealed concerning the identity of the child's mother and the closer circumstances of her relationship to the composer. He could have left for Vienna in November 1806 in order to pursue better career prospects north of the Alps, without even knowing that his wife was pregnant. Soon after his arrival in Vienna, whether from loneliness, opportunism, or necessity, our handsome young guitarist became involved in activities which were clearly extra-marital in nature. The available evidence suggests that Giuliani entered into a liaison with a certain Fräulein Willmuth, probably in the period November 1806-March 1807. The natural consequence of this affair was the birth, in 1807, of the composer's only known illegitimate daughter, Maria Willmuth. The child's German-sounding name leads one to suspect that her mother, whose name she presumably took, was not of Italian origin; she may well have been a native Viennese with a weakness for a certain handsome Italian guitarist. We don't even know if she survived the childbirth. Whatever the case, to Giuliani's credit he acknowledged young Maria Willmuth and looked after her for the rest of his life, even establishing a sizable dowry for her in Vienna at the height of his career in 1817. Her 1807 birth makes it plausible, given the facts of human gestation, that our guitarist arrived in the Imperial City in the time for the 1806/07 concert season. Heck's presumptions concerning Giuliani's arrival in Vienna and his somewhat hurried extramarital activities with a female admirer in the Imperial City are quite reasonable. And yet two details in Heck's description of possible events are wrong: 1) Maria Willmuth was not born in 1807 and 2) her mother's name was not Willmuth. What is known about Giuliani's extramarital love life in Vienna? In 1814 the Vienna police administration received word that Giuliani was having an intimate relationship with a Viennese lady that some people considered intolerable. The files 845/1814, related to this report, and 201/1816 from two years later did not survive the 1927 fire at the Palace of Justice. But a document from 1815 concerning the measures taken by the Vienna police is extant, and since it was recorded in the card catalog that was compiled from the charred files in 1927, it was published by Thomas Heck in his 1970 dissertation. Originally I wanted to use Heck's transcriptions for this blogpost, but then I realized that, because all his transcriptions of Viennese archival sources are flawed and none of the shelfmarks he provides is correct, I have to present my own transcriptions and translations. The decree (the term "police report" is a misnomer), dictated and signed on 9 September 1815 by the head of the Vienna police administration Franz Baron von Hager zu Alensteig, reads as follows (the document is structured in the old backwards order of Vienna police files of which Heck was unaware. Guitarren Spieler Giuliani / soll mit einer sich[eren] Wieselberger hier / leb[en] u höheren StandesPersonen / einen Kuppler abgeben. Der bekannte Chitarr Zytherspieler Giuliani soll hier mit einer gewissen Wieselberger auf einem in vertraulich[en] Verhältnissen stehen, während er sein Weib und Kind in Triest oder Venedig in großer Noth darben läßt. Ich habe der aus obigem Anlaße schon am 23. Febr[uar] 1814 an die P[o]l[izey]d[irektion] ein Dekret erlassen. Nachdem Giuliani nun auch für höhere StandesPersonen mit Kuppeleyen sich abgeben soll, so kann sein regelloser Lebens Wandel nicht geduldet werden. Die Pld wird denselben daher ungesäumt zu strenger Behand[lung] ziehen und den Ausschlag mir gutächtlich vortragen. The guitar player Giuliani is said to live with a certain Wieselberger and provide procuration for persons of higher social status. In the same [desk] was the ring I received from Her Majesty the Duchess of Parma, without the stones which I was forced to get rid of because of the illness of the poor Nina Wiesenberger. The passage in Giuliani's letter of 23 July 1822 to Domenico Artaria, referring to the stones "le quali fui costretto disfarmene per la Malattia della povera Nina Wiesenberger" (A-Wst, H.I.N. 69.731). This passage was first published by Heck who, for unknown reasons, did not publish the full text of Giuliani's surviving letters to Artaria. As was the case with Giuliani's illegitimate daughter, Maria Willmuth, the guitarist also took care of the mysterious figure of Nina Wiesenberger in her time of need, even if it involved selling precious stones from a ring awarded him by no less than Her Majesty Marie-Louise herself. It is quite impossible now to determine or to judge the relationships which Giuliani might have had with his legal wife, as with Wiesenberger. This perspective is too pessimistic. It is possible to judge the relationships that Giuliani might have had "with his legal wife, as with Wiesenberger". A number of recent archival discoveries makes it possible to prove that Giuliani never took his legal wife to Vienna and instead started a second family with Nina Wiesenberger, who not only was the mother of Maria Willmuth, but also of two other daughters of Giuliani. Maria Anna Elisabeth Theresia Katharina Wiesenberger was born on 30 July 1784 in Vienna's Trattnerhof, the second daughter of the "Passischer Niederlags Kompagnon" (co-partner of the Passy trading company) Johann Georg Wiesenberger and his wife Maria Anna, née Delacoste. Since her relative financial independence was an important factor in Anna Wiesenberger's adult life, it is necessary to delve a little into the history of her family. Nina Wiesenberger's father Johann Georg Wiesenberger was born on 2 November 1742 in the Upper Austrian village of Taufkirchen an der Trattnach. His father was an innkeeper, but later rose to the rank of a "Kastner" (steward) in the service of Georg Adam, Prince of Starhemberg. In 1766 Johann Georg Wiesenberger went to Vienna and, in the following year, joined the company of the Savoyard "Niederlagsverwandte" (international wholesale merchants) Passy & Delacoste. He obviously showed such prowess as a businessman that on 1 January 1780 he was able to conclude a six-year contract and become a business associate of his former employers. The company (with stores in Vienna, Graz, Linz, Krems and Brünn) was run by Peter Claudius Passy and Christoph Delacoste, with Wiesenberger as silent partner with an investment of 4,700 gulden. By December 1780 Wiesenberger's share had already increased to over 13,000 gulden. On 27 May 1781 Johann Georg Wiesenberger married Maria Anna Delacoste, the daughter of his business partner Christoph Delacoste (A-Wd, Tom. 74, fol. 34). Christoph Delacoste hailed from Morrilon in Upper Savoy, his daughter (Wiesenberger's first wife) had been born in Vienna on 3 September 1759 (A-Wd, Tom. 83, fol. 318v). Her godmother had been Maria Anna Perinet, the mother of the playwright Joachim Perinet. The godmother of six of these children was their grandmother Elisabeth Delacoste; except for the first, all of these children were born in the Trattnerhof. In 1791 Johann Georg Wiesenberger in good understanding ended his association with Passy (who was to die on 3 June of that year) and entered a business partnership with the wholesale merchant Johann Nepomuk Wildauer (1744-1817). Nina Wiesenberger's mother died on 1 February 1792 of "Schleimschlag" (a stroke) as a result of the difficult birth of her last child. 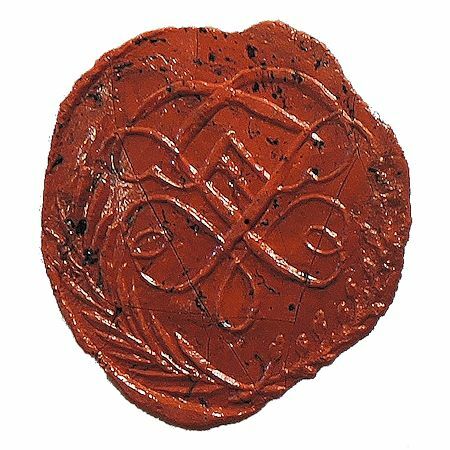 Her estate was estimated at 29,678 gulden 41 kreutzer of which her widower and her three surviving daughters, Elisabeth, Anna and Maria, each inherited a quarter. As of March 1792, the total value of Wiesenberger's and his wife's investment in Wildauer's company amounted to 47,599 gulden 56 kreutzer (A-Ws, Mag. ZG, A2, 1588/1792). Wiesenberger's friend, the court agent and notary Karl von Herlein (1764-1817) was appointed curator of the children. 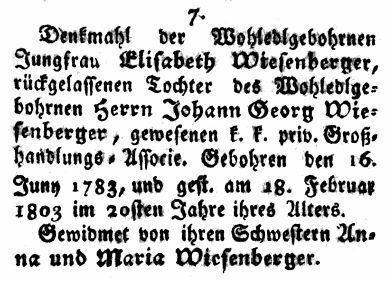 On 16 September 1792 Johann Georg Wiesenberger got married for the second time (A-Wstm, SP 1, 65/1792). His second wife was Maria Anna Hauptmann (b. 29 July 1774, d. 18 July 1849), daughter of the goldsmith and jewelry appraiser Johann Caspar Hauptmann (1740-1826), with whom Wiesenberger was acquainted because he lived on the same floor in the Trattnerhof. As of 1810, Johann Caspar Hauptmann was to become the father-in-law of the famous singer Anna Milder-Hauptmann. The entry concerning the publication of the banns on 31 August 1792 for Johann Georg Wiesenberger's second wedding. This entry in the Trauungsrapular of St. Peter's has never been digitized (A-Wstm, SP, Rapular 2). 9. As main and universal heirs I appoint my three children, named Elisabeth, M. Anna and Maria, who should receive all my assets after the deduction of the aforesaid bequests and the amounts for my wife, stipulated in the marriage contract. In witness whereof I personally signed the present will and explicitly requested the two witnesses to do likewise. For an annual fee of 150 gulden Wiesenberger appointed Karl von Herlein guardian of his daughters. One item listed in Wiesenberger's Sperrsrelation, which was not evaluated, points to musical activities of the three Wiesenberger sisters. It is a "small square fortepiano in a desk of walnut wood, in the property of the daughters". After the subtraction of all the bequests and the dowry of Wiesenberger's widow the net inheritance of the three Wiesenberger daughters amounted to 32,590 gulden 42 kreutzer. Each of the girls legally owned assets of 10,863 gulden 34 kreutzer. This relatively great wealth at a relatively young age is essential for the understanding of Anna Wiesenberger's situation in the following decade. Her secure livelihood enabled her to maintain a lifestyle which brought her some freedom from the reins of society and obviously made her prone to Giuliani's advances. It also helps us understand how a certain grade of wealth made it much easier to keep the birth of an illegitimate child a secret and to secure the discretion of representatives of the clergy. The legal proceedings related to Wiesenberger's estate lasted until 1806. The final page of the "Theillibell" (distribution table of inheritance) of the three Wiesenberger daughters, drawn up on 31 October 1805. The four columns on the right show the shares of Elisabeth, Anna and Maria and their individual totals, consisting of eight 4,000 fl shares. The amount of 584 fl 39 kr at the bottom of the table is the rest of the inheritances from the girls' mother and grandmother. The table is signed by the guardian Karl von Herlein (A-Wsa, Mag. ZG, A2, 3545/1802). Looking back at the events that followed Johann Georg Wiesenberger's death, the guardian of Wiesenberger's three daughters Karl von Herlein was not to be envied. He had to oversee and administer the financial subsistence of his wards by continuously rendering accounts of the expenses, and applying to their "Obergerhab" (superior guardian), the civil court of the Vienna Magistracy, to release the necessary funds. A great part of Johann Georg Wiesenberger's probate file deals with the administration of the inheritance of his underage daughters which makes it possible to track their fate. 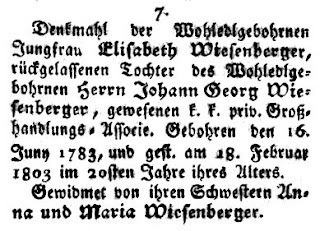 The eldest daughter, Elisabeth, died of nervous fever on 18 February 1803 in the house Tiefer Graben 234 and was buried in the communal cemetery in Währing. The inscription on her tombstone, erected by her two surviving sisters, is preserved in the book Sammlung der auf den Gottesäckern der kais. auch kais. königl. Haupt- und Residenz-Stadt Wien befindlichen Grabschriften und Denkmähler. In 1803 the assets of the deceased Elisabeth Wiesenberger amounted to 25,605 gulden (A-Wsa, Mag. ZG, A2, 668/1803) which in 1807 were divided between her two younger sisters. The documents related to the administration of the Wiesenberger estate become especially interesting when it became apparent that one of the two remaining daughters was pregnant. For an annual boarding wage of 1,000 gulden (which was later raised to 1,100 fl.) Anna and Maria Wiesenberger were put into the care of Maria Anna Schwarzrock, the owner of a I. & R. privileged metalware and button factory. In summer of 1805 Maria Wiesenberger had to take the waters in Baden to treat her "Drüsen=Anschoppungen" (congestion in the glands). She had to be accompanied by Frau Schwarzrock, and, because Anna could not be left alone in Vienna, she also had to go to Baden. In summer of 1806 the three of them went to Heiligenstadt, where Maria took the waters, because she had suffered a bout of rheumatic-nervous fever. All of this needed an explicit permission from the Vienna municipal court whose "Depositenamt" (municipal treasury) held the assets of the Wiesenberger estate. On 17 February 1808 Karl von Herlein submitted an interesting document to the Vienna Magistrate. Because his ward Anna Wiesenberger was in the late stages of a pregnancy, Herlein described the arrangements he made, listed the extraordinary expenses in connection with the impending childbirth and requested them to be covered with his ward's assets that were held by the court. Because Herlein's account provides a rare look behind the scenes of the preparations for an illegitimate childbirth of a member of the upper-class, it shall be quoted here extensively. of the I. & R. Capital and Residential City of Vienna! After the commission I received on 12 February of this year I immediately went to every possible effort to find the appropriate location for the childbirth of the underage Anna Wiesenberger, but I only found three midwives, who currently have free rooms, namely Theresia Bernegger in the Inner City [Stadt], Johanna Hengst at the Platzel [St. Ulrich] and Theresia Rotter in the City. Because the order A of 16 February that I received today exclusively referred to honest midwives in the City, Johanna Hengst, who lives on the first floor in the suburb, could be disregarded, although nothing is wrong with her in regards of her integrity. Because I had not received a special recommendation concerning Theresia Rotter and because it already looked suspicious that – probably on the request of my ward – she inquired on her own with me, which lets me presume that there is some silent agreement, I can only recommend Theresia Bernegger, and all the more so, because she is generally known in regards of her honesty and years of experience. An Honorable Magistrate in regards of the minor Anna Wiesenberger, for the time of her lodging with the aforesaid midwife Theresia Bernegger, an amount of time which cannot be specified in advance, may deign to give me the legal permission to pay for an extra room including heating, service, breakfast, lunch and dinner at 3 gulden per day and to pay the midwife 50 gulden for her efforts during the childbirth. 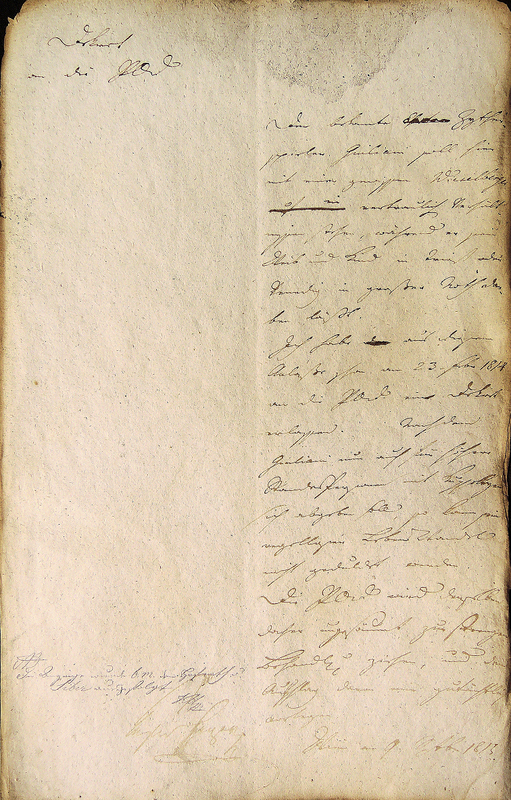 The first page of Karl von Herlein's 1808 report concerning his preparations for the birth of Anna Wiesenberger's illegitimate child (A-Wsa, Mag. ZG, A2, 3545/1802). For the time of her elder sister's stay with the midwife, the other ward Maria Wiesenberger was to be accommodated at the Ursuline convent in the Johannesgasse, where her guardian had to pay an annual boarding wage of 300 gulden plus 14 fl laundry fee. These expenses also had to be approved by the civil court. Jahr Monat Tag 1808 20. April. There is a second, later copy of this entry in a short series of "Taufrapulare" which was meant to be a representative clean copy, but was obviously abandoned in 1814. The only difference it shows is that the note "von eigenen Mitteln lebend" (living on her own means) is written out. If enough money was available, it was easy to pull off a baptism of an illegitimate child with a false name. As we have seen, Theresia Bernegger charged twenty gulden for the arrangement of a baptism. Since the mother was not allowed to leave the bed for nine days, the child was brought to the parish by the midwife who also provided the priest with all the information and very likely accompanied the procedure with a pious donation. The midwife Theresia Bernegger, née Hollner was born around 1766 in Pressburg. On 9 October 1786 (Pfarre Maria Rotunda, Tom. 1, fol. 110) she married Johann Michael Bernegger, a hairdresser from Salzburg, with whom she had several children. In 1808 she was already a widow. The house Stadt 523 was located very close to St. Stephen's Cathedral and the baptismal records of this parish show that Theresia Bernegger had specialized in her profession: she mostly practiced in her own quarters and almost exclusively helped deliver illegitimate children. Sometimes she also stood proxy for a prominent godfather, like for instance on 3 September 1808 when she substituted for the musician Joseph Hofmann (A-Wd, Tom. 105, fol. 108). The name "Willmuth" – an obvious paraphrase of the German word "Muthwille" (wantonness) – might well have been Bernegger's invention, because two years later, on 25 May 1810, she had an illegitimate boy baptized at St. Stephen's who was similarly named "Alexander Wehmuth". Another case of the use of a fantasy name by Bernegger is the baptism of an illegitimate daughter of the Swiss Joseph Andreazzi on 23 February 1809. Bernegger gave the name of the mother as "Josepha Cremelini", although her real name was Rosina von Mafficioli (A-Wd, Tom. 105, fol. 143). The description of Maria Willmuth's mother as "von eigenen Mitteln lebend" was the truth however. Maria Willmuth's godfather was the doctor of medicine and renowned obstetrician Johann Leser (1770-1810). The assistance of Dr. Leser, who was frequently hired as obstetrician by members of the high nobility, is yet another sign that money was no issue and that Anna Wiesenberger received the best possible care. Maria Willmuth lived with her mother until 1817. Then she was put into the care of a foster-mother until she was taken to her father in Italy in 1822 by Giuliani's sister Emanuela Lucci. The mistaken assumption that she returned to Vienna and again went to Italy in 1824 will be dealt with below. In his correspondence with the Vienna Magistrate, which remained Maria Willmuth's superior guardian until after Giuliani's death, Giuliani always addressed her as his "Ziehtochter" (foster-daughter). In summer of 1808 Anna Wiesenberger's situation changed fundamentally. She turned twenty-four, became of legal age and thus gained the right to manage her own assets. The municipal secretary Benedikt Gruber had the nine promissory notes issued by Johann Wildenberger, whose total value was 32,677 gulden 32 kreutzer, copied into bills of smaller nomination and paid out Anna Wiesenberger her share of the inheritance. On 4 November 1808 Anna Wiesenberger signed the following receipt. certify herewith that today I have correctly received 14,331 f 50 3/8 x from the municipal secretary Benedikt Gruber. as former guardian and attester as witness. which is well-known to me. A report, written on 19 November 1808 by the municipal secretary Benedikt Gruber concerning the distribution of the rewritten promissory notes between Anna and Maria Wiesenberger ("Ausweisung über die aus der Johann Georg Wiesenbergerischen Verlassenschaft erfolgten 9 Stück Wechsel per 32677 f 32 x"), is the next to last document in the probate file of Johann Georg Wiesenberger. Surprisingly, towards the end of Gruber's report, as a result of what seems to be a Freudian slip, the name "Willmuth" appears. Gruber obviously refers to Anna Wiesenberger's younger sister and erroneously uses the name of her daughter. This document is a part of Johann Georg Wiesenberger's Sperrs-Relation and it is the earliest appearance of the name "Willmuth" in an official document related to a member of the Wiesenberger family, the earliest documentary proof that Anna Wiesenberger was Maria Willmuth's mother. A major part of Anna Wiesenberger's wealth was fictional already in 1808. The value of Johann Wildauer's promissory notes depended on Wildauer's liquidity which was reduced not only by the galloping inflation that accompanied the Napoleonic Wars, but also by Wildauer's hapless restructuring of his business. In 1807 he bought the stocking factory in Poneggen Castle from Joseph Wenzel Count Thürheim and in 1814 he invested most of his remaining assets into the establishment of a pencil factory (A-Wsa, Merkantilgericht, Fasz. 3, 1. Reihe, W 122). This business enterprise failed and in 1816 Wildauer had to declare bankruptcy. He died on 22 February 1817. Wildauer's bankruptcy explains, why there were no significant assets to be found in Anna Wiesenberger's estate. Furthermore, as will become apparent, it also explains, why the municipal court dealt with Maria Willmuth until 1835. Giuliani scholars have always considered Emilia Giuliani-Guglielmi a legitimate daughter of Giuliani and his wife Maria Giuseppa, née del Monaco (1779-1826). One can imagine that his tales of fame and fortune would have inspired Signora Giuliani to make the long voyage to Vienna herself, either with her husband in the fall of 1811 or some time the following year, in 1812. The basis for this supposition is purely biological: the Viennese passport archives[sic] record that Giuliani was the father of a legitimate daughter (one that took his name rather than that of the mother), namely Emilia, born in Vienna in 1813. There is no "biological basis" for this supposition. In 1813 mothers could easily assume a false name and illegitimate children could legally be given their father's name, if the biological father came forward and officially professed to his fatherhood. In the case of Wiesenberger and Giuliani this option was of course impossible. Giuliani's wife Maria Giuseppa never went to Vienna. Her husband had absolutely no interest in risking the exposure of his secret parallel family by having his wife visiting him. Like her sister Maria Willmuth, Emilia Giuliani also was a daughter of Anna Wiesenberger and there may have been several reasons as to why she was given her father's name: Anna Wiesenberger's first pregnancy may have been unintentional, a kind of accident that was dealt with in an excessively discreet way. In 1808 there was no reason to establish any traceable connection between the child and its father. The second pregnancy was very different: Giuliani and "La Nina" were now living together as a family and they wanted this daughter to bear her father's name. Wiesenberger was now of legal age and therefore she had the right to hire the midwife of her choice: Theresia Rotter, whom, as we have seen above, she had already sent in 1808 to inquire with her suspicious guardian Karl von Herlein. Rotter pursued a different method of naming illegitimate children: she let the mother chose her own fake name and thus the family name of the child. Emilia Emanuela Maria Anna Giuliani was born on 23 April 1813 in Theresia Rotter's apartment in the house Stadt 180, "Zum Bacchus" (last No. 173, today about Wipplingerstraße 24) and baptized at the Schottenkirche. Rotter presented the priest with the following identity of the child's mother: "Maria Giuliany, daughter of the merchant Georg Giuliany in Triest and Magdalena, née Mayer". The name "Georg" is an obvious reference to the child's grandfather Johann Georg Wiesenberger, the name "Magdalena Mayer" is pure random, probably made up on the spot by the midwife. The mother was presented as a widow, but did not give the name of her deceased husband which at that time was a vital part of a widow's identity and social status. This seemed a little odd to the priest and therefore he added the following note to the baptismal entry: "The mother described herself as a widow, but did not give her husband's first name". Wohnung und Nro. des Hauses. Hohebrücke No 180. Vaters Namen und Kondition oder Charakter. Mutters Tauf= und Zunamen. Giuliany Maria / Anna Tochter des / Georg Giuliany / bürgl Kaufmanns / in Triest und der / Magdalena geb. / Mayer / kathol. Pathen. Theresia Rotter / Wundarztens / Wittwe kathol. Anmerkungen. Heb: Theresia / Rotter auf der / Hohenbrücke No 180. / Die Mutter hat sich / zwar als Wittwe angegeben aber den / Geschlechts=Nahmen ihres / Mannes nicht angegeben. Emilia Giuliani's place of birth: the house Stadt 173 (on the left) at the corner of Tiefer Graben and Wipplingerstraße. 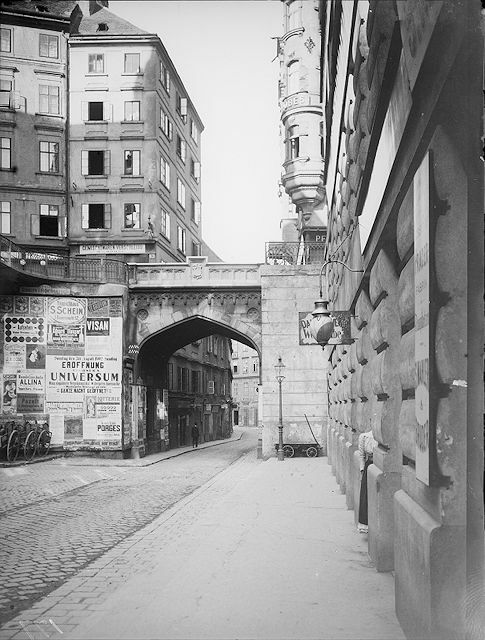 The building was torn down in 1905 (A-Wn, L 25.600B). Emilia's godmother, the midwife and "Wundarztens Wittwe" (surgeon's widow) Theresia Rotter was born in Baumgarten in what was then Prussian Silesia (today the Polish village of Braszowice). The question of the identity of Rotter's surgeon husband, still needs additional research. After her mother's death Emilia Giuliani was put into Vienna's k.k. Waisenhaus (I. & R. orphanage) and into the care of two foster mothers who will be dealt with below. Karolina Katharina Giuliani was born on 17 September 1817 at 1 p.m. in Theresia Rotter's apartment at Stadt 235 (last numbering 228, torn down 1899, today Tiefer Graben 22), where Rotter had moved after 1813. 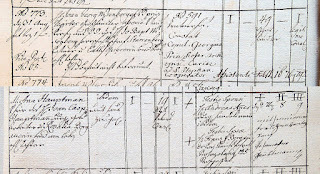 Theresia Rotter, born 1772, "Hebamme v Baum[garten] in kk[sic] Schles[ien]" on a conscription sheet of Stadt 228, her residence in 1817. Carolina Rotter, described as "Anv[erwandte] may have been her daughter (A-Wsa, Konskriptionsamt, KB Stadt 228/6v). Theresia Rotter was acquainted with other musicians as well. Between 1816 and 1821 she served as godmother of three children of the music copyist Wenzel Schlemmer. Karolina Giuliani was baptized the following day at the Schottenkirche. This time Anna Wiesenberger was not presented as widow, but as "Kaufmannstochter" (merchant's daughter) to which the priest added "angeblich" (allegedly), a discriminitary note which at that time was frequently used by priests to comment on single mothers. The godmother Katharina Angeli was probably Johanna Katharina, née Pöller, the wife of the wax monger Johann Jakob Angeli (A-Wstm, Tom. 9, fol. 33). There were at least three Angeli brothers in Vienna who hailed from the (then) Tyrolean village of Cloz. The most successful of them was Anton Angeli (1778-1831), a canvas trader and silk manufacturer who was ennobled in 1819. Pathen. Angeli Ka- / tharina, Kauf= / manns Gat= /tinn kathol. Anmerkungen. Rotter The= / resia in / der Stadt / No 235. After the death of her mother Karolina Giuliani was put into foster care with a certain Anna Stahl at Weißgärber No. 34, "Zum goldenen Kegel" (last numbering 39, today Hintere Zollamtsstraße 17) where she died of consumption on 25 March 1818. Güelliani H[errn] Maurus, Musikmeister, / sein Kind Karolina, N. 34. untern / Weisgärbern, b. [ei] d.[er] Anna Stahl, pens. Beamtens = Witwe, an der Auszehr. [ung] / alt 5. Monat. Abends 7 1/2 Uhr. / Ferini. "Dem H Maurus Giuliani Musikmeister sein Kind" Karolina Giuliani was buried on 27 March 1818 in St. Marx Cemetery. The entry concerning the exequies and burial of Karolina Giuliani. Note the underlining of the word "Musikmeister" (Pfarre St. Rochus und Sebastian, Tom. 4, fol. 383). 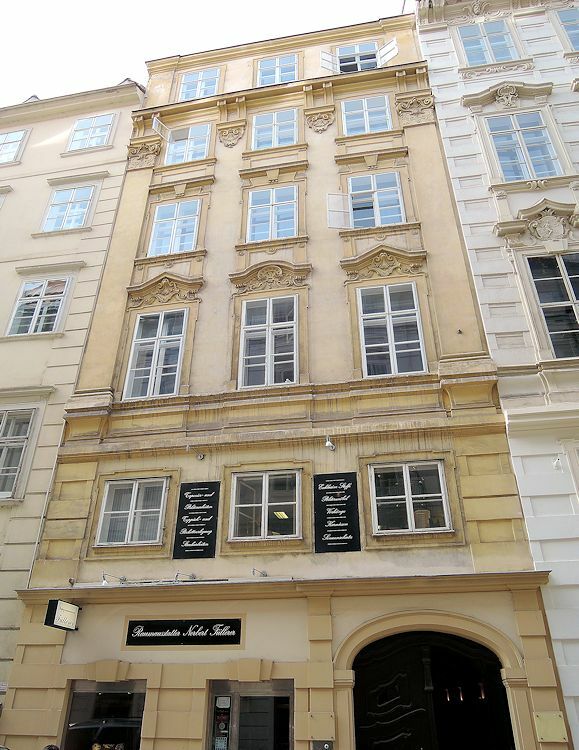 It is not yet known where exactly Anna Wiesenberger lived in Vienna between 1808 and 1817. Her only documented address so far is Schottenbastei 1167 (today Helferstorferstraße 13) where her name appears on a conscription sheet from around 1816. She is given as "Großhändlers Tochter" with the wrong year of birth 1775. I have not yet found Mauro Giuliani's name on a Vienna conscription sheet. Not only was he obviously trying very hard to escape the attention of the Vienna authorities, many of the so-called Fremdenbögen (on which foreigners were registered) from before 1830 have been discarded. On 1 October 1817, exactly two weeks after the birth of her third child, Anna Wiesenberger died of "Nervenfieber" (nervous fever) at the house Stadt 949 (last numbering 893, today Singerstraße 18). Wiesenberger Anna, Großhandlers = Tochter, ledig, / hier gebürtig, im Schönauerischen H.[aus] / N. 949. in der Singerstraße, am Ner= / venfieber, alt 34. Jr. Mittags 12. Uhr. / Trunck. Wiesenberger Anna, daughter of a wholesale merchant, born here, in the Schönauer house, No. 949 in the Singerstraße, of nervous fever, aged 34, at noon. [Vincenz] Trunk. The entry concerning Anna Wiesenberger's burial on 2 October 1817 in St. Marx Cemetery is especially interesting, because it is the only source where she is described as "Wirthschafterin" (housekeeper). She was a housekeeper indeed: Giuliani's housekeeper. Wagen mit 2 Pferd 10 f 28. kr. The maiden Anna Wiesenberg. Housekeeper, aged 34, died in the Singerstrasse No. 949, St. Stephen's parish on 1 [October] at noon and was inspected of nervous fever. Carriage with 2 horses 10 f 28. kr. Anna Wiesenberger's place of death, the house Singerstraße 18, where from 1819 on Mathias Fröhlich lived on the fifth floor with his four daughters Anna, Barbara, Katharina and Josephine. In this house Schubert made the acquaintance of Grillparzer. No trace of Wiesenberger or Giuliani are to be found in the conscription sheets related to this building. The musician Mauro Giuliani is immediately to be summoned and registered to appear on 13 [October] at 10.a.m. to name a guardian for the 3 underage children. Concerning the death [of] Miss Anna Wiesenberger, surviving daughter of an I. & R. wholesale merchant. On the backside of the sheet Johann Adolph Heeg, the head of the Magistrate's filing department, summarized the result of Giuliani's visit of 13 October 1813: a "Curatelsdecret" (decree of guardianship) was to be sent to the newly appointed guardian Dr. Polz and Giuliani was summoned to appear again at the city hall on 24 October. The "Hof- und Gerichts-Advokat" Dr. Georg Polz was born around 1756 in Neumarktl (today Tržič) and died a bachelor on 10 May 1822. He was succeeded as guardian of Giuliani's daughters by the City sequestrator Sebastian Reindl (the legal situation precluded Giuliani from becoming the guardian of his own illegitimate children). The title page of Anna Wiesenberger's probate file. Note the entries: "Surviving husband: none" and "Surviving children: three in state of illegitimacy" (A-Wsa, Mag. ZG, A2, 2663/1817). The most informative entry on the file's cover sheet is the one referring to the three children of the deceased person on folio 1v. The Sperrs-Kommissär Joseph Friedrich Reuth's entry concerning Anna Wiesenberger's three children, their father and her will on fol. 1v of her probate file (A-Wsa, Mag. ZG, A2, 2663/1817). Giuliani's address, given as "Stadt 939" instead of 949 – indicating that he did not live together with his family – could be a mistake or an attempt to hide his real address from the court. On the other hand this address makes sense, because the house is located right opposite Wiesenberger's last residence and it is the address (last numbering 885, today Singerstraße 13) of the court agent Joseph von Pernold who had been living there since at least 1798 and in 1822 was to provide lodging for Maria Willmuth. In any case, Giuliani's name does not appear in the records of the house Stadt 939. The house Singerstraße 13 (Stadt 939/885), the only address of Giuliani's that can be documented so far. This house was built in 1784. The entry on folio 2r of the cover refers to the possible assets of the deceased as follows: "The assets will be shown by the judicial drawing up of an inventory. In consideration of the underage heirs and the emergency heirs respectively, the "enge Sperre" (narrow distraint) has been imposed." 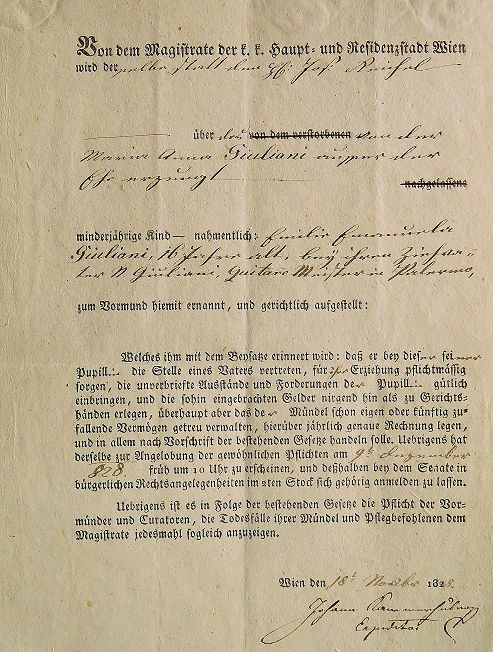 This statement was attested with signatures by the Sperrskommissär Joseph Friedrich Reuth, Mauro Giuliani and the municipal furniture appraiser Joseph Schreyer. 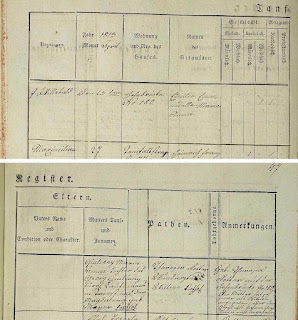 The entry in the municipal civil court's Officiosa (the register of probate and guardianship files) concerning Wiesenberger's Sperrs-Relation shows that on 19 December 1817 Wiesenberger's movables were submitted to the obligatory appraisal and recorded in an inventory. The last item in the list of documents reads "Inventur samt Relaz:[ion] dd° 19 Xbr 817. pr 106f.". This inventory of Wiesenberger's belongings is unfortunately not preserved. Mauro Giuliani's autograph form of oath, presented on 3 March 1818, concerning Anna Wiesenberger's assets. On the left is the German translation, on the right Giuliani's oath (A-Wsa, Mag. ZG, A2, 2663/1817). Io Mauro Giuliani presto un giuramento vero e solenne senza ritenzione o ambiguita di parole, ch'io non penso in altero modo che come parlo, e non parlo, e non parlo altrimenti che come penso, e come potro giustificare una volta avanti il judice omnipotente et omnisciente cioè chio non connosco un altro bene della defunta donna Wiesenberger, che quello che comparisce in un valore estimato a 106 fr WW. nell Inventario fatto della facolta di detta Signora Wiesenberger, ch'io non celato o supprimo un altro bene, nemeno chio suppia[sic], che sià stato celato o supprimato un tale bene da qualche altro, et tutto questo e cossi vero come desidero che dio m'ajuta! I, Mauro Giuliani, do swear a solemn oath without retention or ambiguity of words, that I do not think different from how I speak and I do not speak different from how I think, and how I will be able to justify once before the omnipotent and omniscient judge that I do not know of any other asset of the deceased Miss Wiesenberger, beside the one that compares to a value estimated at 106 gulden in Vienna Currency in the inventory of Miss Wiesenberger's assets, that neither did I hide or cover up any other asset, nor do I know of any other that may have been hidden or covered up by somebody else. This is so true as I wish that God may help me! On 27 July 1818 the judicial procedure related to Anna Wiesenberger's estate was officially closed by the municipal court. What the Vienna Magistrate did not become aware of in 1817 and what Giuliani certainly did not know, was that a small part of Wiesenberger's inheritance was still held by the estate of Johann Nepomuk Wildauer who had died on 22 February 1817. Because the lawsuit concerning Wildauer's bankruptcy was still pending and Anna Wiesenberger's assets were frozen in Wildauer's estate, the true value of her estate (and the inheritance of her two surviving children) only was to become apparent in 1818. 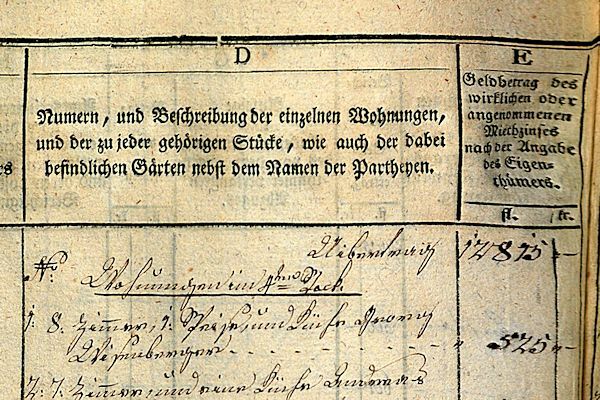 The fact that on 17 August 1817 – a month before the birth of her last child – Anna Wiesenberger wrote a will suggests that she was already very sick. It was for her treatment that Giuliani had to sell the stones in the ring that he had been given by the Duchess of Parma. Wiesenberger's will, which was submitted to the court on 7 October 1817, reads as follows. Anna Wiesenberger's will, written on 20 August 1817. This document has been very clumsily restored in the early 20th century (A-Wsa, Mag. ZG, A10, 483/1817). [note by the court official] To be kept on file after today's official announcement und copies to be made. Written on August 20th, 1817. There are four entries in the registers of the conscription office of the Vienna Magistrate concerning passports that were issued for Giuliani's daughters Maria and Emilia, of whom two have been published. With the help of Gustav Gugitz's card catalog at the Municipal and Provincial Archives of Vienna, Heck was able to find two of these entries and he published them in his dissertation with wrong folio numbers and without their dates. Heck did not look for other entries himself. Because the entry dating from 1824 has always been completely misunderstood by Giuliani scholars, I take the opportunity to publish these sources again in this post. The first entry refers to the issuance of a passport to Maria Willmuth and Emilia Giuliani, "daughters of a guitar teacher" on 4 November 1822 to travel to their father in Palermo. The girls are given as fifteen and nine years of age, both born in Vienna and they resided with a "Theresia Tramonto" at Stadt 1005 (today Krugerstraße 1). "Theresia Tramonto" was Theresia Tramonti, the wife of Domenico Tramonti and sister-in-law of the opera singer Stephania Tramonti, all three of whom in 1816 are documented under the name "Dramonda" to have lived in Vienna at Stadt 945 (Kärntnerstraße 23, A-Wsa, KB Stadt 945/2r). 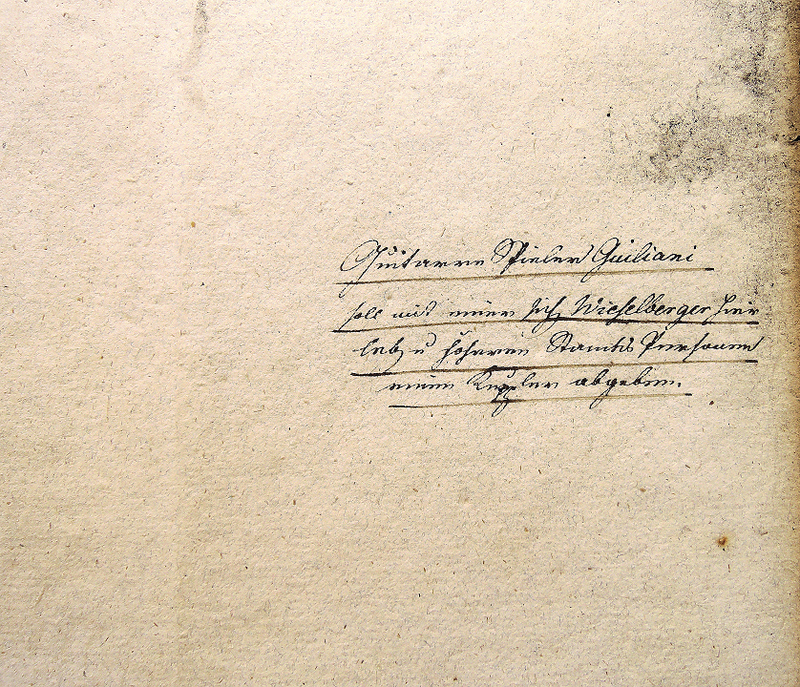 The signature of Domenico Tramonto in the 1798 probate file of the composer Peter Dutillieu (A-Wsa, Mag. ZG, A2, 3040/1798). Tramonto was born around 1762 in Lucca and was a "befugter Kostgeber" (licensed boarding provider) by profession. On 1 May 1826 he died of a stroke at Stadt 1005. The family relation to Domenico Tramonti is corroborated by a "Referatsabschrift" (report copy) of 24 October 1822 in the Magistrate's correspondence concerning Emilia Giuliani's guardian. The entry, referring to the destination and the duration of the passport's validity (mistranscribed as "to remain with their benefactor" by Heck), reads: "[Reiset nach] Palermo bei ihrem Vater zu verbleiben [Dauer des Paßes] Zur Hinreise" ("Travelling to: Palermo to remain with their father. Duration of validity: for the journey there"). Furthermore we have the testimony of the Viennese passport archives to the effect that Mauro's daughters Maria (now age 17) and Emilia (age 11) went in 1824 from Vienna "to Palermo, to remain with their benefactors. [sic]"
This statement is based on a profound misunderstanding of the source in question. The entry in the passport protocol, dated 31 May 1824, does not refer to an issuance of a passport, but to the renewal of the earlier one. In 1824 neither Giuliani (contrary to his promise to Artaria) nor his daughters were in Vienna. The reason why their guardian, the City sequestrator Sebastian Reindl, living at Wieden 365, appears in the entry, is that he was the sisters' legal representative in Vienna. The girls did not travel a second time from Vienna to Palermo in 1824. They stayed in Palermo with their aunt, and because both of them were underage and still had a guardian in Vienna, they needed to renew their passport. 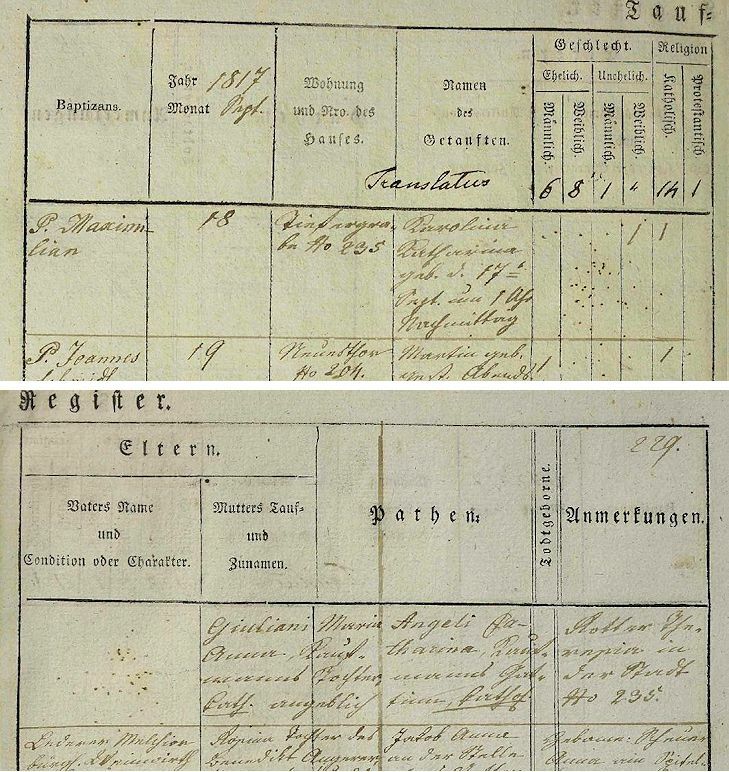 The 1824 entry referring to the destination and the duration of the passport's validity (missing in Heck's transcription) reads: "[Reiset nach] Palermo beÿ ihrer Tante in die Kost [Dauer des Paßes] 1 Jahr." ("Travelling to: Palermo in foster care with their aunt. Duration of validity: one year"). The passport of Giuliani's daughters was renewed three more times: in October 1825 (not issued by the Magistrate), in 1827 and in 1828. The following, hitherto unpublished entry in the passport protocol refers to a renewal of the sisters' passports on 22 June 1827. The entry in the municipal passport protocol concerning the renewal of the passports of Maria Willmuth and Emilia Giuliani on 22 June 1827 The sisters' guardian was now the City sequestrator Reichel, they are described as "foster daughters of the guitar master Giuliani", the destination is "to Palermo for their return" and the renewal was valid for one year (A-Wsa, Konskriptionsamt, Passprotokoll B4/13, fol. 215). 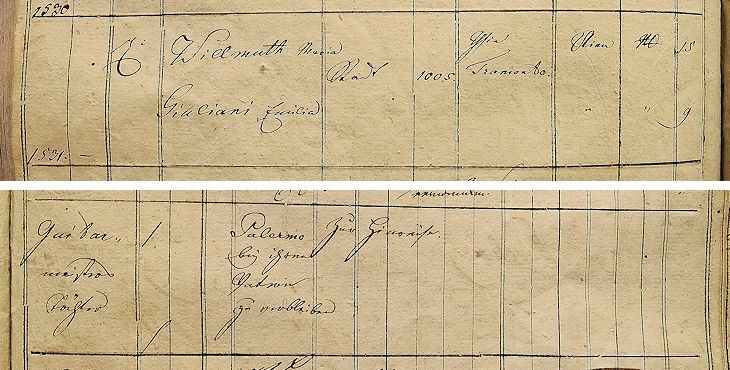 On 31 October 1828 the passports of Maria Willmuth and Emilia Giuliani were renewed yet again. The following entry has also not been published before. The entry in the municipal passport protocol concerning the renewal of the passports of Maria Willmuth and Emilia Giuliani on 31 October 1828. The address is now "ohnbest[immt]" (unknown), the sisters' guardian is still Joseph Reichel, living at Wieden 54. They are described as "foster daughter of the guitarist Giuliani" and the validity is noted with "Verlängert" (extended), followed by "unbemittelt" (poor) (A-Wsa, Konskriptionsamt, Passprotokoll B4/13, fol. 215). 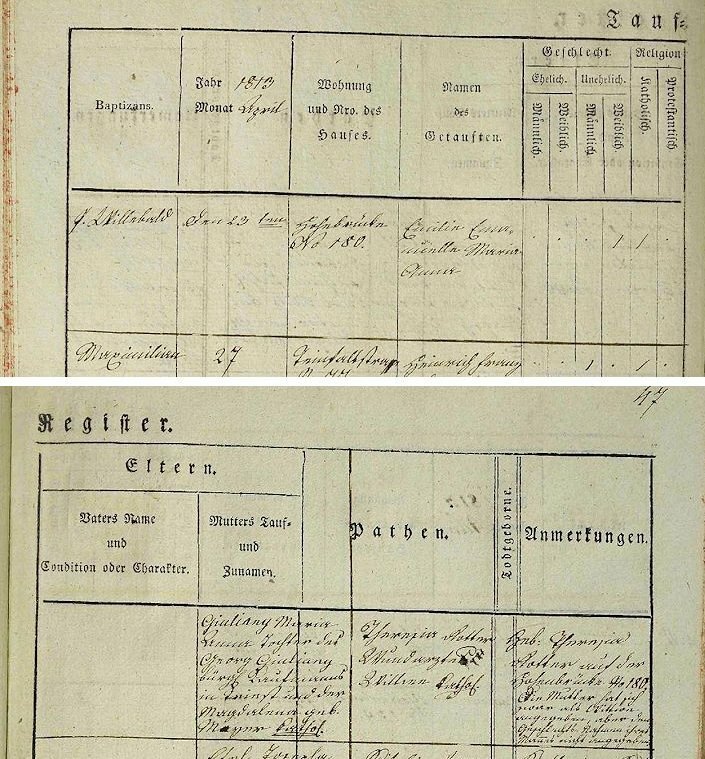 Maria Willmuth's passport was renewed again in 1830 by the Lower Austrian Provincial Court. As Gerhard Penn has shown in 2014, Giuliani left Vienna for good on 3 August 1819. Penn was able to prove that after going to Prague, Karlsbad, and possibly Munich, Giuliani returned to Italy via Innsbruck. Giuliani's presence in Venice in November 1819, where he stayed at the Locanda Gran Bretagna, is documented by his letter to Domenico Artaria (A-Wst, H.I.N. 69.730). Giuliani stayed in Venice for two weeks and then went to Trieste to stay with his parents for three months. He was hoping to make money by giving concerts in Italy and in his letter describes his plans to go to Paris and return to Vienna via the Netherlands and Germany. That in his letter to Artaria he not once mentions his wife and his upcoming reunion with her, gives rise to the thought that he had never told his friend that he was married. Giuliani certainly intended to return to Vienna at some time and to personally take his two daughters with him. But for economic or perhaps medical reasons this plan never came to fruition. The recent discovery of a 100-page file in the holdings of Vienna's municipal civil court sheds new light on the events surrounding the departure of Giuliani's daughters to Italy. A complete publication of this archival material is of course not possible in the scope of a blogpost. I gladly leave this work to be done by Giuliani experts. A passport had to be issued for the children. Following a new regulation, published on 19 October 1822 by the Lower Austrian government, a guardian had to be appointed for Emilia Giuliani. Maria Willmuth's maternal heritage had to be administered by her guardian also after she had left Vienna. In a conflation of names, which resembles the above-mentioned Wiesenberger-Willmuth-mix-up in Johann Georg Wiesenberger's probate file, the Magistrate filed the proceedings related to this case under "Willmuth Emilie m". The ten entries related to Giuliani's daughters in the court's Officiosa registers from 1822 until 1835 provide only a very meager documentation of the events. The earliest entry already refers to the court's reaction to Lucci's original request (whose registration is referred to with "vid: ult: Pag: 122."). The earliest entry in the 1822 Officiosa, describing the immediate actions of the municipal court in response to Emanuela Lucci's request. Note the name "Willmuth Emilie m [minor]" and the names "Emilie Willmuth und Emilie Giuliani" in the entry (A-Wsa, Mag. ZG, B1/277, W, p. 114). Government decree of 12 of this month No. 50180. Report until 7 November concerning the request of Emanuela Lucci for a passport for her niece Nina Maria. Considering the fact that according to the conducted inquiry the supplicant's nieces, for whom the issuance of a one-year passport was requested, are underage and born here, I forward all files to the justice senate by means of a report copy with the friendly request: to report here as soon as possible, with the inclusion of the communications, whether on the part of the superior guardian, there is no objection against the issuance of a passport for the aforesaid wards Maria and Emilie Giuliani. At the same time I advise the honorable senate to urgently speed up this case, because in case of a delay, the supplicant may leave without taking her nieces with her and the chance for support of these poor wards would be lost. The honorable political senate has to be informed immediately that no objection prevails here against the issuance of a passport to Palermo for the thirteen-year-old Willmuth. As far as the nine-year-old Emilie Giuliani is concerned, according to inquiries, she is under the supervision of the orphanage and therefore a letter has been sent there; it is also noted, by the way, that Maria Willmuth owns an asset of 800 gulden in Vienna Currency which is invested in the mortgage of a house, of which the certificate is kept by this department. In regards of this decree the court agent Ritter von Pernold is to be summoned to provide information concerning Nina Giuliani who is staying with him. Also to be summoned to appear on 25 October at 10 a.m. are Emanuela Lucci, née Giuliani, staying with Dominik Tramonti at Kärntnerstraße 1005, 5th floor, and the City sequestrator Sebastian Reindl as guardian of the minor Emilie[!] Willmuth, with his decree of guardianship. The Vienna Magistrate on 24 October 1822. Emanuela Lucci's request to the Vienna Magistrate to schedule a hearing concerning her departure with her niece Maria Willmuth (A-Wsa, Mag. ZG, A3, 594/1822). This document is not autograph. The Honorable Magistrate may deign to schedule a speedy date of hearing with the calling in of the City sequestrator Mr. Reindl as appointed guardian of my said niece, to deliver a statement concerning my request and accordingly grant the permission as superior guardian. On 26 October 1822 the Magistrate's political senate initiated the issuance of a passport to Palermo and sent a letter to the administration of the I. & R. orphanage to release Emilia Giuliani from its custody to which the Waisenhaus Direction responded on 27 October 1822. Since the statement of the orphanage provides an interesting view on Emilia Giuliani's early childhood, it shall be quoted here in extenso. The second and third page of the orphanage's response of 27 October 1822. In the middle section is the court's response concerning the appointment of Emilia Giuliani's guardian (A-Wsa, Mag. ZG, A3, 594/1822). The administration of the orphanage does not know at all, whether the girl Emilie Emanuela Giuliani, who previously was considered an orphan, has a guardian or not. Because this issue became the administration's duty only through the high circular note of 25th of this month. In accordance to a high government decree of 25 September 1820 Emilie Emanuela Giuliani already became a recipient of the care of the orphanage's poor relief fund, and on 16 October of that year was transferred from the hands of her previous foster-mother Theresia Glück into the care of the widow of a civil servant Anna Franz who lives at Strozzigrund 41. – It was on the 3rd of the current month when Emilia Lucci, née Giuliani told the administration of the orphanage that she had the assignment to take her niece back to her father or grandfather Mauro Giuliani. Because at that time she produced a written declaration which was signed by Mauro Giuliani and attested by the ambassador in Rome, his Excellency Count Apponyi, the administration of the orphanage could give Mrs. Emanuela Lucci no other answer than the following: the orphanage cannot oppose her request; in addition to that it offers to support it and, if she would need it, provide assistance in getting a passport. It seems that she did not need any help from the orphanage at all; because since the aforesaid day (3 October) she did not show up anymore and the previous foster-mother, the widow Anna Franz, on the occasion of the handing in of the payment form, notified us that on the 12th of the current month, Signora Emanuela Lucci had taken over her niece. Thus she [Anna Franz] was paid the subsistence expenses only until the afore-mentioned day. Considering the circumstances, the question cannot be the compliance or noncompliance with a high order, of whose existence the administration of the orphanage could not be aware before the 19th [October], when it was published in the official gazette, and before the 25th, when it was delivered directly from the high provincial government. This is being responded to yesterday's honorable notice without delay and with respect. The City sequestrator Sebastian Reindl was appointed guardian of Emilia Giuliani, the issuance of a passport for the children was granted and in early November 1822 they left Vienna with their aunt. But of course this did not mean that the children were legally allowed to emigrate. They were underage, had a guardian in Vienna and hence the Vienna authorities expected them to return at some point. The lawsuit that followed Johann Nepomuk Wildauer's 1816 bankruptcy was settled in 1818. After all judicial procedures were over Maria Willmuth's net maternal inheritance – the sad remains of a small fortune that had been reduced by the state's and Wildauer's bankruptcies – consisted of nothing more than a certificate of debt of 840 gulden 40 kreutzer WW (Vienna Currency), bearing five percent interest, signed on 4 May 1818 by the canvas imprinter Jakob Fink and his wife Rosina. The guardian Sebastian Reindl collateralized the remaining debt of 640 f WW with a mortgage on Fink's house, Margarethen 153 (today Schönbrunner Straße 45). Maria Willmuth's asset of 640 f WW among the liabilities, listed in the probate file of Rosina Fink who died on 11 March 1828 (A-Wsa, Mag. ZG, A2, 4851/1828). Rosina Fink owed Willmuth 128 gulden CM which is half of the total mortgage converted into Conventionsmünze. Jakob Fink's house was sold in 1838. Fink died on 25 November 1849. 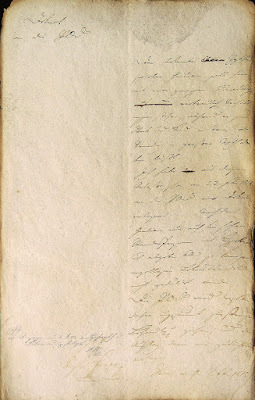 A section of Giuliani's letter to Artaria of 13 May 1828 (A-Wst, H.I.N. 69.734). Heck's varying transcriptions of the first sentence of this paragraph are very flawed. The above-mentioned Magistrate, in the account sent to me, tells me that from the entire period as of 26 November 1827 it holds 840 gulden Vienna Currency, 100 gulden Assimilated Coinage [Conventionsmünze], and one gulden 56 kreutzer [CM] in cash. The quandary Giuliani was facing regarding his daughter's inheritance, was basically the result of his life choices in Vienna and his illegitimate propagation. His daughter Maria Willmuth was underage until 1832, he was neither her legal father nor her legal guardian and from the point of view of the Vienna authorities her stay in Italy could only be temporary. 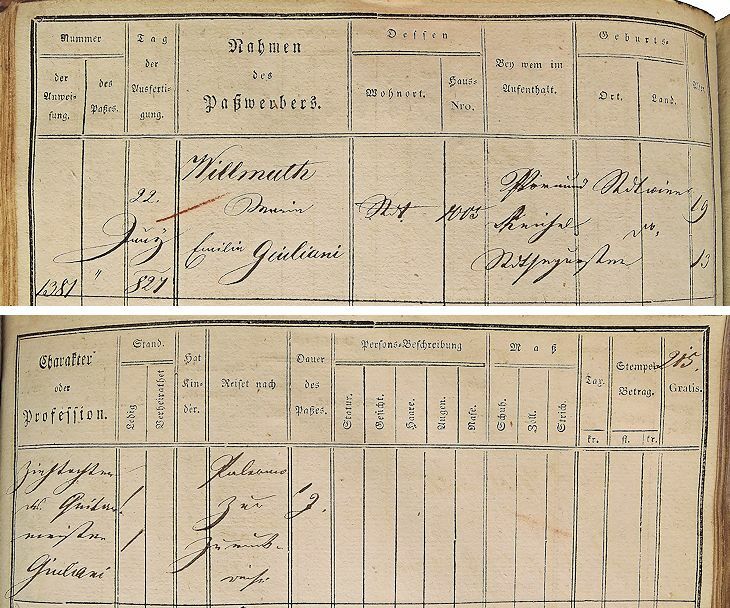 There was no way of getting Maria Willmuth's money to Italy before she became of age and even after 1832 this transfer would have involved a payment of a ten percent departure tax ("Abfahrtsgeld"). Years went by. In 1825 Willmuth's guardian Sebastian Reindl was replaced by the "k.k. Landrechts-Gültenschätzmeister" Joseph Reichel who in 1829 was succeeded by the City sequestrator Peter Würth. 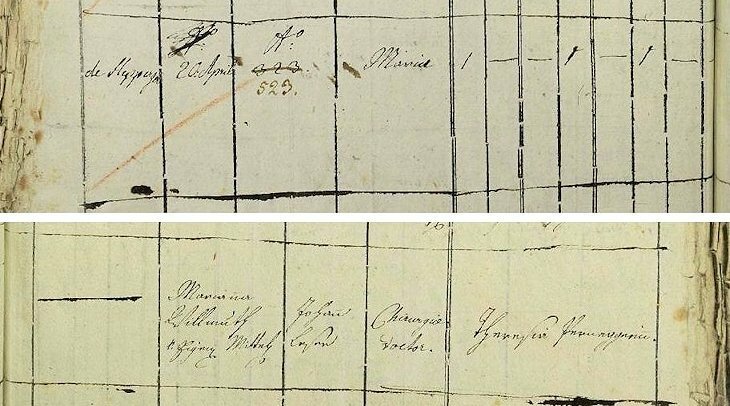 The amount of Anna Willmuth's assets in gulden Conventionsmünze (in bonds and cash), registered on 13 November 1827 by the municipal secretary Johann Baptist Umlauf. 101 f 56 x CM is the amount that appears in Giuliani's letter of 13 May 1828 (A-Wsa, Mag. ZG, A3, 594/1822). The Vienna Magistrate wanted Maria Willmuth to return to Vienna, either alone or with her father, to personally negotiate the withdrawal of her money. This was impossible, because Giuliani could not leave Naples, his daughter could not go to Vienna alone, and most importantly, the amount of money that was to be withdrawn was not high enough to be worth the long and expensive voyage. In April 1828 Giuliani had his daughter write a declaration, whose authenticity was attested by the Austrian embassy, and sent it to Vienna, together with an affidavit for his friend Artaria to withdraw Maria's money. In a letter to the Vienna City Council, which was probably translated into German in Artaria's firm and written on a blank leaf of paper, signed by Giuliani in advance, Giuliani explains why he and his daughter Maria could not go to Vienna and expresses his hopes that the documents he sent to Vienna would facilitate a successful withdrawal of his daughter's assets. Ihr Werthes Schreiben aus Wien den 26t Xber 1827, ist mir hier erst vor wenigen Tagen samt den beilagen zugekommen, säume dahero nicht, meine schuldige Dankbarkeit, und folgende Erklärung zur werten gefälligen Verhandlung bekannt zu machen. Your esteemed letter of 26 December 1827 from Vienna, including the attachments, has reached me only a few days ago, thus I do not wait to express my due gratitude and to present the following statement concerning further kind negotiations. A girl of this age cannot be made to take such a long voyage, the costs of which would exceed the assets that are to withdrawn and besides, she must be cared for there. My interests hold me back here and I could certainly not accompany her. Considering this, and because for the last six years I have like a father taken care of everything for my foster-daughter, so that the cost of the teachers needed for her education (according to my rough calculation) has exceeded the amount of her assets that are deposited there. 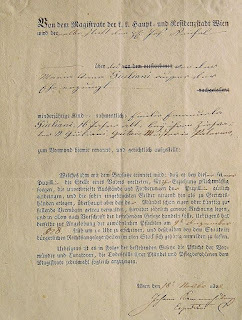 Because, on the other hand, I certainly intend to fatherly take care of her in the future, I had the enclosed original document by my foster-daughter Maria Willmuth officially attested at the chancellery of the local I. & R. Embassy, to withdraw the amount deposited at the honorable Vienna City Council. I also sent Mr. Domenico Artaria, art dealer on the Kohlmarkt, a written affidavit, to initiate everything necessary, to receive the amount at hand in behalf of my foster-daughter and send it to me. Archduchess Maria Louise of Parma etc. Even Willmuth's guardian in a statement to the Vienna authorities confirmed that the entire inheritance could not balance the expenses that Giuliani had already invested into his daughter's education. Giuliani did not live to see the transfer of his daughter's money. In the last letter he wrote to Artaria on 10 April 1829 he still refers to recovering "il principale" and the interest of Willmuth's money. The main issue for the Vienna Court Chamber in connection with Willmuth's assets was not their transfer abroad, but the question as to whether Willmuth would ever return to Vienna. In case of her definite emigration the legal situation was completely different. After her father's death in 1829 Maria Willmuth continued her effort to get her money with more decided means. In November 1830 she applied for an emigration permit and asked Domenico Artaria and Prince Pignatelli (who seems to have been a friend of her late father) to intervene with the Vienna authorities. At the same time she announced that she intended to marry, which from a tactical point of view may not have been a good idea. The realization of her plans turned out to be more difficult than expected. Yet another obstacle appeared: the immigration laws of the Kingdom of the Two Sicilies provided for a very high immigration fee that would have consumed Willmuth's entire inheritance. In a report of 29 November 1830, which was copied for the City of Vienna's politico-economic senate, the gist of Artaria's and Pignatelli's petition and a description of the new obstacle survive. Dominik Artaria and Prince Pignatelli request permission for the transfer of the assets of the underage Maria Willmuth. The underage Maria Willmuth, a local ward aged 21, is currently staying with her foster-father Mauro Giuliani in Naples. Her guardian is the City sequestrator Würth; she owns an asset, part of a mortgage worth 640 f WW. The supplicants present a declaration by the ward wherein she concedes this amount to her foster-father, as a small compensation for his love, care, fostering and the good deeds he has done, and an affidavit by M. Giuliani for Dominik Artaria to receive the money. The guardian confirmed that by receiving this amount M. Giuliani will by far not be compensated for what he has done and paid for the ward. Before the delivery they turned to the I. & R. Court- and Chamber-Procurator with the question, if departure tax would have to be paid from the amount that is to be withdrawn. This was answered to the effect that, owing to the fact that no Austrian citizen living abroad can be denied to have money sent to him to cover his needs, the delivery can even less pose an offence, since the amount itself is insignificant and can well be considered to serve the purpose of her subsistence. If there were a reason however to assume that the same [ward] has the intention not to return to the Austrian States, the delivery of the assets could under no circumstance take place, on the contrary, the Court- and Chamber-Procurator would have to reserve all the rights that the treasury could accrue from the ward's illegal or suspicious absence and would explicitly insist on the refusal of the delivery and the taking of legal action. Now the guardian has declared that the ward is planning to get married in Naples and not to return to the Austrian States, that in the meantime M. Giuliani has died, that the guardian, together with D. Artaria and Prince Pignatelli, has applied for an emigration permit for the ward at the provincial government, and that a hearing is currently pending at the esteemed political senate of this Magistrate; finally that he was told by the secretary of the Neapolitan embassy that the taxes for the ward's possible admittance into the union of Neapolitan citizens are substantial and would consume the ward's entire assets. Thus it is necessary to ask the esteemed political senate for information concerning the pending negotiation regarding the requested emigration. Willmuth's certificate of admittance to the Kingdom of the Two Sicilies did not arrive in Vienna. On 7 December 1830, the municipal counselor Johann Leopold Stöger wrote the following: "Although already in April of this year Prince de Pignatelli and Dominik Artaria applied for an emigration permit for Maria Willmuth, who has been staying for several years with her foster-father Mauro Giuliani in Naples, the previous negotiations could not be continued, because the certificate of admittance could not be produced on the part of Maria Willmuth. Because the supplicants themselves are concerned that it will take some time until this document can be supplied, and therefore declared that for the time being they abstain from their application and will renew it as soon as they receive the certificate of admittance in question. [...] No further negotiation has been conducted in the case of Maria Willmuth and it can only be continued and concluded after the arrival of a certificate of admittance and a new application." Maria Willmuth's marriage plans seem not to have been realized in 1831, because in none of the Viennese sources is she being referred to as having a different name. In January 1832 she decided to bypass the Vienna Magistrate by using a different official channel to succeed in the effort to obtain her money. She had the Austrian embassy in Naples intervene directly with the state chancellery in Vienna. From the state chancellery the case went to the highest judicial office which forwarded it to the court of appeal, or to express it in Austrian terms, the "K.K. Appellations= u. Kriminal=Obergericht in Oesterreich ob und unter der Enns" whose head, Friedrich Christian Baron von Gärtner, in February 1832, requested an official statement concerning this matter from – the Vienna Magistrate. The Magistrate, on 8 March 1832, with the inclusion of the entire correspondence, sent the requested report to the court of appeal of which a copy survives in Willmuth's guardianship file. This document – a kind of written distillate of Biedermeier bureaucracy – is essentially an account ab ovo gemino Ledæ. It begins with Maria Willmuth's baptism "on 20 April 1808 as illegitimate child of Maria Anna Willmuth, living on private means", among other things, points to the fact that the obligatory ten percent "Abfahrtsgeld" had already been paid by the guardian Würth in 1831, and explains that the only remaining obstacle for the release of Willmuth's money was the continuing denial of the emigration permit which could not be granted, as long as the permit of admittance from Naples had not arrived. In dutiful observance of the high order of 11 August 1835, appellation No. 9257, within the further deadline, granted with the high decree of 22 September 1835, appellation No. 10708, in regards of the delivery of Maria Willmuth's assets, it is obediently reported back that the sent decree of the Lower Austrian government, whereby Maria Willmuth was granted the permission to emigrate from the Austrian States, including the sent Italian documents related to this, were delivered to the local art dealer Dominik Artaria, who previously had intervened in matters of Maria Willmuth, and (because an affidavit to receive money cannot be found in the file and also could not be presented by him) that the same has been told to submit the properly instructed delivery application [Erfolglassungsgesuch] for Maria Willmuth's assets that are deposited here, including a proper affidavit, made out to receive money, or, in case Maria Willmuth wants a direct delivery of her asset to Naples, to specify here the way of dispatching and the Neapolitan authority to which the money is to be sent. 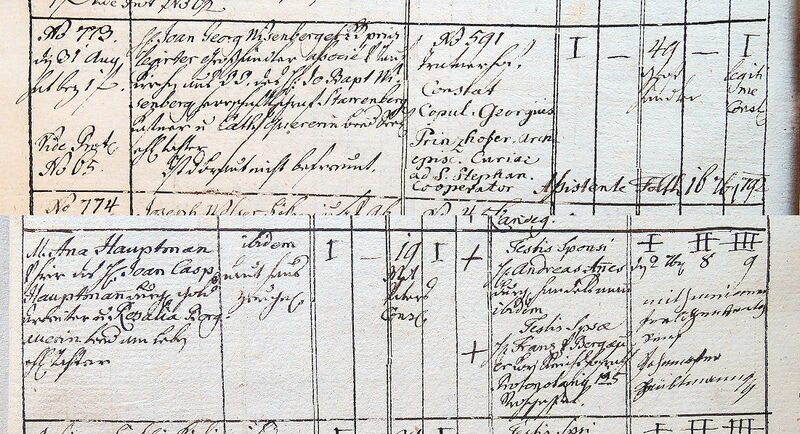 Willmuth's latest appearance in a Viennese archival source occurs in the register of mortgages (Matzleinsdorf Satzbuch E) of the Herrschaft Domkapitel which also contains the mortgages of the houses in Margarethen. The entry concerning the mortgage on Jakob and Rosina Fink's house Margarethen 153, which consisted of Maria Willmuth's inheritance, shows that the mortgage had been contracted in 1818 by Willmuth's guardian Sebastian Reindl. A detailed note on the margin of folio 191 of the register, dating from December 1836, reveals that in October 1822 from the original amount of 840 gulden Vienna Currency 200 gulden were paid to Emanuela Lucci to cover her travel expenses. In December 1836 Willmuth's mortgage was assigned to the master dyer and manufacturer of imprinted canvas Hermann Blumauer (owner of Neubau No. 6) who paid Dominik Artaria 640 gulden in Vienna Currency. [fol. 191r] According to the presented baptismal certificate of the local metropolitan and main parish of St. Stephen's, Maria Willmuth was baptized on 20 April 1808 and therefore is of legal age. Incorporated on 12 December in consequence of the decree of 12 December 1836. [fol. 191v] By means of the assignment of 19 November 1836 Maria Willmuth, represented by her mandatary Dominik Artaria, who was legitimized with an affidavit, attested in Naples and dated 16 December 1835, assigned the alongside mortgage of 640 fr. W.W. including 5% interest without any further liability to Mr. Hermann Blumauer, whereby Jakob Fink as sole debtor acknowledged the correctness of this obligation, to pay back this fund on request, but with six months notice, and, in the meantime, to pay the agreed 5% interest in rates of six months, failing that, with immediate due date of payment. The entry (on the left margin) concerning the sale of Willmuth's investment to Hermann Blumauer in December 1836 (A-Wsa, Patrimonialherrschaften, GB 128/17, fol. 191v). The main text, where Willmuth's name appears in the second line, refers to the original mortgage of 1818. In late 1836 Maria Willmuth finally received the meager remains of her maternal heritage. 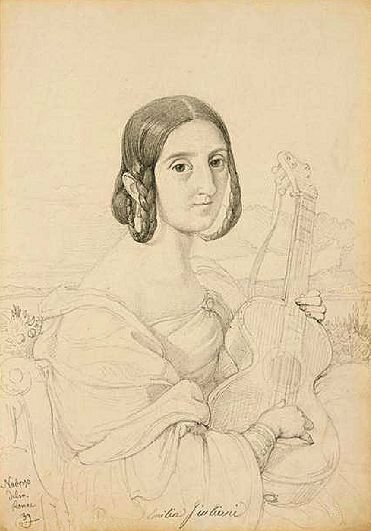 Contrary to the life of her sister, who had a career as guitarist and composer and became a kind of icon as female musician, nothing is known about Maria Willmuth's life after 1836. It will be one of the many tasks of future research to shed more light on her biography. The unveiling of Giuliani's private life in Vienna is far less surprising than the fact that it took more than two-hundred years until it came to light. Giuliani's three illegitimate daughters may also affect his image as hot-blooded artist from southern Italy. But in my opinion the most important part of this discovery is the fact that Emilia Giuliani-Guglielmi's biological mother Anna Wiesenberger finally enters the stage of music history. Anna Wiesenberger having been the mother of three of Giuliani's children should above all be appreciated as what is was: a great, secret and eventually tragic love story. There is no reason to assume that after his return to Italy Giuliani ever got together again with his wife. Their marriage seems to have been already over in 1807. A number of questions still remain and a couple of research tasks are left to be carried out. I have been unable to resolve the obvious question as to why the long lasting Wiesenberger-inheritance-problem did not apply to Emilia Giuliani as well. She also must have inherited some assets from her mother. Did her family name and the fact that she was not a foster-daughter, but a *real* one play any part in the avoidance of legal problems in her case? There are of course a lot of "archival spots" that cry out for a deeper digging. During the last three weeks I had a number of interesting ideas, but it is too early to discuss them in public. To be honest, I never wanted to delve into Giuliani research. But he proved relentless and eventually caught up with me. Heck, Thomas F. 1970. 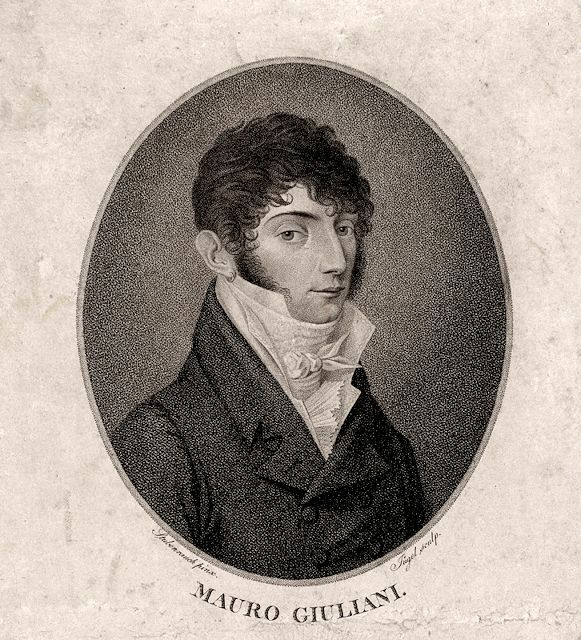 The Birth of the Classic Guitar and its Cultivation in Vienna, Reflected in the Career and Compositions of Mauro Giuliani (d.1929). PhD. Diss. Yale University. –––––– 1995. Mauro Giuliani. Virtuoso Guitarist and Composer. Columbus, OH. Editions Orphée. –––––– 2013. Mauro Giuliani. A Life For The Guitar. Guitar Foundation of America. GFA Refereed Monographs No. 2. Austin, TX. Kindle Edition. Penn, Gerhard. 2014. "Mauro Giuliani und andere Gitarristen in München – Übersehene Fakten und verschollene Werke". Paper given at the EGTA-D-Symposium. Garching bei München. 26 October 2014. Riboni, Marco. "Mauro Giuliani: un aggiornamento biografico". Il ‘Fronimo’. No. 81 (1992). 41-60. No. 82 (1993). 33-51. The research for this blogpost, which was prompted by the discovery of the file concerning Maria Willmuth's guardianship (A-Wsa, Mag. ZG, A3, 594/1822), was conducted between 18 and 25 March 2015. I thank my niece Valentina Lorenz, Bakk.phil. and Federica Ligarò for their assistance with the translation of Italian texts, and Dexter Edge for his advice in matters of translating historical Austrian vocabulary. © Dr. Michael Lorenz 2015. All rights reserved. Michael Lorenz’s blog post, “New Light on Mauro Giuliani’s Vienna Years,” fulfills this very wish of my mine. Honest scholars can do nothing but greet well-documented corrections of older “error and misinformation” with joy. Will theirs be the last word? . . . Time will tell. . .
"I was doing this research (1968-69), Vienna’s archives were nothing like what they are today." Pardon me, but this is not an argument. The archives were even better back then, because the staff was much more educated and more competent. Nothing has improved since then in this regard and to really find things is much more difficult today. All the printed archival means that exist today, already existed back in 1968-69. I didn't look for Giuliani material at all. Since December 2014 I have been systematically browsing the municipal "Waisensachen", beginning with the year 1783. Time and routine are needed to find things, the "situation in Vienna's archives" has nothing to to with it. I don't really want to address the quality of your pioneering Giuliani book in more detail. Let me just say that I paid good money for the Kindle Edition, only to realize that between 1970 and 2012 you hadn't been willing to correct at least the old typos (not to mention all the other mistakes) and to synchronize the footnotes with the updated text and vice versa. I have the right as a customer to say this, etiquette has nothing to do with it. Interestingly, an orphan Aloysia Willmuth died on February 20th,1812 in Wieden No. 427 at an age of 1½ years. The entry (Wien, Pfarre Wieden, Tom 03-06, Fol. 27) reads as: Willmuth Aloysa [sic] Elternlose / Waise. Sofar I could not locate a birth entry of this child. Whether this name is again an invention of Theresia Bernegger (who died on June 30th, 1811) and/or this child has anything to do with Anna Wiesenberger and Mauro Giuliani requires more archival search which has to be done. Aloysia Victoria Maria Willmuth was born on 13 August 1810 at Wieden 427 and baptized at St. Karl (Tom 5, fol. 157). She also seems to have been a daughter of Giuliani and Anna Wiesenberger, because Anna's sister Maria Wiesenberger was her godmother. Research is always making progress! The correct shelfmark of the entry concerning Aloysia Willmuth's death is Pfarre St. Karl, Tom. 3, fol. 297. She seems to have died in foster care. I am wondering where Anna Wiesenberger lived in those years. At least for Giuliani we know it partially. Concert announcements in the Wiener Zeitung disclose two of his living addresses. In April 1810 he lived at Singerstrasse 947 (the Domherrenhof; today Singerstrasse 22; Joh. Georg Albrechtsberger died there in 1809) and in May 1811 he lived at Bognergasse 337/338 (today at the corner Bognergasse 1). See my article in "Il Fronimo No. 169, Jan. 2015". Aloisia Willmuth died of malignant pneumonia at Wieden 427 (today Schleifmühlgasse 13) in the care of Helena Lichtenstein, widow of an I. & R. cashier (A-Wsa, TBP 133, W, fol. 9v). According to Heck's Giuliani article in vol. 7 of the new MGG, Giuliani died on "8. Mai 1820". Heck has absolutely no right to ask for "scholarly etiquette". I am sorry to hear about the erroneous 1820 death date for Giuliani. My original Giulani, Mauro article for MGG, accepted in 2002, has the correct date, 8. Mai 1829. A typographical error evidently occurred in the new MGG. No one has that right. I realize it may be unpleasant to see corrections to one's previous writings but when it is a matter of setting the record straight, by publishing the contents of documents that were recently found. but have survived in archives for over two centuries, there are no "issues of scholarly etiquette". Ihr Artikel ist bemerkenswert und hat das Bild von Hartmann über Hess total geändert. Sie haben äußerst fundiert gearbeitet. Seit fast 10 Jahren arbeite ich an der Erforschung der einzelnen Mikroschnitzer dieser Zeit. Unglaublich dass Sie ein Bild haben von Hess. Ich selbst habe eine Datenbank dieser Mikroschnitzeraufgebaut und über 600 Mikrobilder gefunden unterschiedlicher Qualitäten. Würde gerne mehr über Ihre Recherche erfahren, welche Institutionen und Archive Sie benutzt haben. Hierzu würde ich auch nach Wien kommen.